It is almost always a problem when something breaks in your home. Whether it is a dishwasher, the hot water heater or the air conditioning, getting it fixed quickly and properly gives you peace of mind. If you own your own home, you need to directly contact the right person when something breaks. If you are renting an apartment or house, you may need to contact your landlord for some repairs. Look at your lease agreement to determine whether the landlord or you are responsible for contacting someone to do the repairs. If you live in an apartment complex with multiple apartments, it is likely you need to get in touch with either the landlord or building maintenance. They can either do the repairs or use the repairman or contractor they prefer in order to fix the problem. If you own your home or your lease agreement specifies that you have to take care of repairs, you need to contact the right person for the job yourself. Understanding who that right person is, however, often confounds consumers. Use the following to make your own list of emergency numbers. Is It A Structural Issue? If you rent your home or apartment, structural issues like new cracks in the walls or a settling floor should always be referred to the maintenance department or your landlord. The owner of the property has to take care of these issues quickly before they turn into bigger problems. Never attempt to take care of something like this yourself and be sure your landlord understands the urgency of the situation. If you own your home, consult your home owner’s policy and speak with them about making repairs. Any appliances that come with your apartment rental such as washers and dryers should be reported to either the landlord or building maintenance. They own the equipment so it is their responsibility to either repair or replace the needed equipment. If you brought your own appliances to the apartment, it is your responsibility to do the needed repairs or hire a professional to take care of them. If you own your own home, the same applies. The owner of the appliance is the one who is responsible for taking care of the repairs. There are always exceptions, so make sure you keep notes on who you contacted and when in case there is a problem in the future. If something is broken because you did something to it or tried to repair it yourself, your landlord may ask you to cover the cost of repairs. When your cable, internet or land line phone stops working you need to contact the service provider. Because these services are in your name, it is your responsibility to get them fixed. Before making the call, check with your roommate or spouse to make sure the service was not terminated due to non-payment. Look to see if there is an outage in the area or whether you have something unplugged or disconnected. If you have double-checked everything and you still do not have service, it is time to contact the provider. Have information, such as the serial number on the cable box and your account number, ready when you call so things go smoothly. If you are handy with tools and are a do-it-yourself person, you can do some minor home repairs yourself. This saves you some hassle and you will not have to wait for maintenance or your landlord to schedule time to come into your home and fix it. 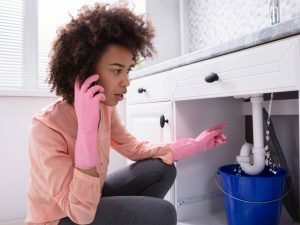 Fixes you can do yourself include unstopping a clogged drain, fixing a leaky drain pipe, replacing a light switch, tightening loose handles or towel racks, oiling a squeaky hinge and repairing a ripped window screen. You can find easy instructions for these types of repairs on the internet. There are thousands of short videos on YouTube demonstrating how to do any of these repairs. Some repairs in your apartment or home can be done by a repairman if the job is too time consuming for you or you simply do not want to do it yourself. These may be small repairs such as loose hinges, a clogged sink, or patching the drywall. If you have several small repairs that need to be completed, you may want to hire a handyman who is experienced in doing a variety of repairs such as fixing a stuck window, a leaky pipe and repairing a faulty outlet. For more complex repairs, a licensed electrician or plumber may be needed. Keep in mind that a handyman does not require specialized training while a licensed repairman or contractor has special training and is licensed to do the work. If a pipe has burst or serious damage has been done, a licensed repairman can fix the problem when you are in over your head. You should always call a repairman if working on an appliance or electronic device yourself voids the warranty on it. Repairs that are complex or require specialized training are best left to professionals. Professional repairmen include licensed electricians and plumbers, ACHV (Air Conditioning, Heating and Ventilation) specialists and carpenters. Some home repairs you should call professionals for include repairs to your cabinetry, flooring, rewiring part of the home, landscaping and hardscaping and any repairs to a swimming pool, hot tub or spa. The higher the repair costs, the more likely it is you should hire a contractor. If the project is complex and takes more than a day to complete, a contractor may be the right choice. If it is a relatively quick fix that most do-it-yourself people could do, a handyman is a less expensive option. Ask any repairman, handyman or contractor for references and call those references before hiring them. If they cannot offer references, move on.